La Dolce Vita: What's so great about sliced bread? As someone who has spent much of her life studying languages, I constantly think about words. I'll go days with a certain word or name stuck in my head. I wonder about semantics. I ponder phrases. Today, I was thinking about the expression, "It's the greatest thing since sliced bread". Who came up with that? Did they really think sliced bread was all that? Sure, it's convenient, but it doesn't compare to a delicious crusty loaf of french bread or sourdough. How could anyone think that a slice of plain Wonderbread could ever compare to ripping into a loaf of artisenal bread, devoid of preservatives, but chock full of crunch when you tear off a delicious piece? This amazing French loaf even has a P on it! Does it stand for Paloma? Perfectly delicious? No, it stands for Poilane, the amazing Parisian bakery that made it. FYI- You can have these babies overnighted to you from France! I am aware of how random this is, but I think we all know that I have fully embraced my randomness. That French loaf is almost too beautiful to eat. And random blog posts are usually the best. Amen! I like to slice my own bread. 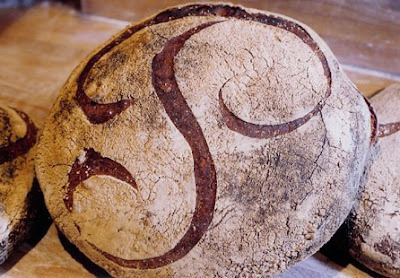 Bread...beautiful bread! Brilliant Asylum, it costs 35 euros to have one shipped to your door, so you may not want to eat it! You may be better off throwing that baby into a shadow box and displaying it in your home. LOL! MMM, I want some fresh baked bread now. 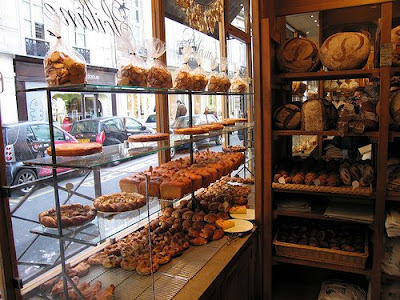 Thanks for the post on Poilane, we're headed to Paris in a couple of weeks and can't wait to check it out!